Located near the Great Pyramids of Giza, the Sphinx was created by Pharaoh Khafra, whose pyramid is the second largest of the three tombs. 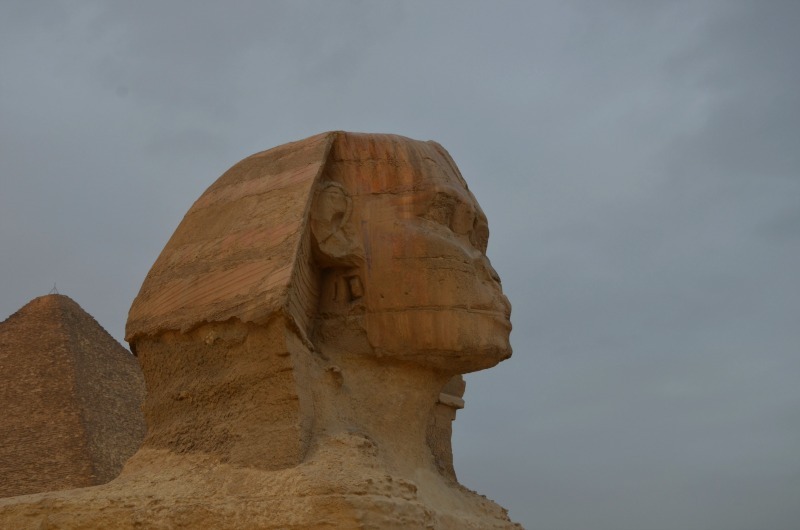 Made of limestone, the Sphinx has the body of a lion and the head of the pharoah. But the long-time mystery – what happened to the nose? I was a reader of Asterix and Obelix as a kid, and loved the Asterix and Cleopatra story, where its revealed the Sphinx’s nose was inadvertently destroyed by Obelix. Another story has been that of Napoleon, whose army destroyed the nose during the French occupation. But the reality? No one is quite sure, but I suspect the current theory that its just the effects of environment and age. The Sphinx was made out of limestone, a very soft substance and is dated to be approximately created in the time period of Khafra, 2558-2532 BC. As the largest monolith statue in the world, it is an icon and unique. And since I was young, I have wanted to see it. When I did, it was overwhelming – and as I watched my group and numerous other people take photos (both serious and silly) I realized how unifying being at the foot of such a piece of history is for all of us. So the nose isn’t there anymore? Really, aren’t we all glad that it still exists? And if we never find out what really happened – well a good mystery will keep us all coming to see it for ourselves.